To start off book a free telephone mediation consultation so you can assess us without obligation as we discuss your situation. There is no pressure. You can book a consultation now, later or not at all, or ask your lawyer to contact us. A helpful mediator will shortly contact you to discuss your circumstances. We discuss your options and explain how we can assist you. If you choose to go ahead, your mediator will make contact with the other party and ask them if they want to participate. If they agree we will book in separate intakes for each of you. Intakes are held by the mediator with each party separately so we can get the information we need, and understand what desired outcome each party wants. Mediation is a type of ADR (alternative dispute resolution or conflict resolution) where you have the chance to discuss property and children's matters in a safe, supportive and confidential environment. Since every situation is different we offer different mediation techniques for different situations. Our focus is family dispute resolution which includes divorce mediation and relationship breakdown. 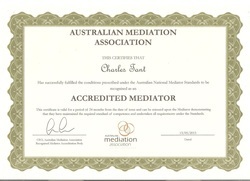 An intake where mediator and client make a series of decisions about the mediation. Sometimes mediation can take place with both parties and the mediator face to face in the same room. Sometimes it is more appropriate that the parties are at different locations (shuttle mediation). Sometimes we use child consultants to interview the children and report back to the mediator and parties (child inclusive mediation). Clients often have many questions. Two of the most common follow. Firstly, how to answer questions from their children about what is happening. Secondly, the principles of property settlement in mediation. In the intake there is a discussion of principles of property settlement and/or parenting and an exchange of information, bearing in mind the confidentiality provisions. The mediation itself. Sometimes during mediation, the desired outcome is the same for both parties, but due to a breakdown in communication they are unaware of this until the mediation. Sometimes there are many overlaps and differences that can be addressed by a few simple compromises. Sometimes there are large differences in the desired outcome and more interventions by the mediator are needed. In any of these circumstances we facilitate communication between the parties to allow for good decision making. Written agreements are often required, where the mediator records the decisions the parties made at mediation, whether that be a settlement document for property or a parenting plan for children. Property settlement and parenting plans may also lead to consent orders explained here by the Family Court. We serve the whole of Australia because distance is no barrier. To get a sense of my passion for social justice in mediation you might care to read an excerpt from my article- ﻿Family Mediation- ﻿﻿Second Class Compromise or First Class Alternative? Some idea of the complex undercurrents that shape Family Law can be gained from my article- Attempts by certain men's groups to reform Family Law- reform for better or worse.